Cycling is finding its way back into vogue as a legitimate means for people to travel to work in cities around the globe. Not so in Hong Kong, where the SAR government sees bicycles on crowded streets as a potential liability. That has not discouraged a group of enthusiastic advocates from continuing to press for expanding facilities for cyclists - even in the very heart of the city, reports Christopher DeWolf. Imagine it's a beautiful autumn day in Hong Kong. The summer humidity has vanished and you're out enjoying the fine weather, bicycling along Victoria Harbour. You pass the Star Ferry pier, the new government headquarters at Tamar, then Victoria Park, all the while gazing out at the jade green water. That was the vision presented by a group of cycling advocates to the Harbourfront Commission on Sept 7. The Hong Kong Cycling Alliance is urging that a 16 km cycleway be included in the commission's plans for a continuous public promenade along the shoreline of Victoria Harbour. Cycling Alliance members argue that cycling will enliven the waterfront while also creating an easy way to travel between the different nodes of activity. "Cycling is the most convenient, efficient mode of transportation known to man - and it's just right for the harborfront, which we want to be a peaceful and well-connected locale," says Martin Turner, a member of the alliance. "I can see a family going there and hiring bikes for an afternoon. And commuters won't have to sit on a bus for 45 minutes at the start of the morning - they can get some fresh air and improve their health." Turner and other cycling advocates hope that giving bikes a place on the waterfront will encourage cycling not only as a recreational activity but as a convenient way to get around the city. That may bring Hong Kong into line with cities as diverse as Hangzhou, New York and Paris, where cycling has become increasingly popular - and where local governments enthusiastically promote it as a healthy, ecologically friendly form of transport. "Our goal is to make cycling a part of everyday life in Hong Kong," says alliance member Philip Heung. For that to happen, though, cycling advocates must face the mother of all obstacles - changing government policy, which does not consider bicycles a means of transportation, even as cycling appears to grow more popular in both the New Territories and the urban areas of Kowloon and Hong Kong Island. 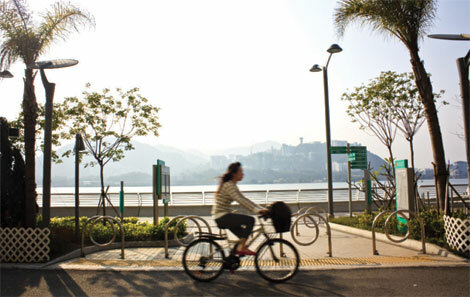 Cycling is already part of everyday life in some parts of Hong Kong, like Sha Tin, Tai Po and Tin Shui Wai. 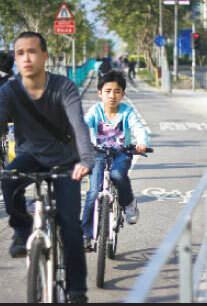 According to a 2009 study commissioned by the Sha Tin District Council, 33.5 percent of the district's 600,000 people cycle at least once a week, and each family owns an average of two bicycles. "We made a novel decision to integrate cycle tracks into the New Towns" when they were being planned and built in the 1970s, says Peter Cookson-Smith, president of the Hong Kong Institute of Planners, who sits on the Harbourfront Commission. Wide bike paths, often lined by trees, were built along waterways and between housing estates. "Now cycling is actually used as a means of transport - kids getting to school and so on." But transport was not necessarily the bike paths' original purpose; even today, they are often seen by the government through the prism of recreational use. New Territories residents complain that the cycling network is disjointed and incomplete, with missing connections between different New Towns and to important venues like shopping malls and markets. In Tai Po, for instance, bike paths run along the Tai Po River, but not to the Tai Po Hui Market or to the Tai Wo MTR Station. A lack of bicycle parking is another frequent complaint. For every 10,000 people living around an MTR station in the New Territories, the Planning Department recommends the provision of 30 bicycle parking spots - not nearly enough to meet the demand created by "thousands of people" who cycle to railroad stations every day, according to New Territories West legislator Albert Chan, who in 2010 said he received hundreds of complaints every month from residents fed up with the bicycle parking situation. The situation in the urban areas is even more dire. Anecdotal reports suggest that more and more cyclists are taking to the streets of Kowloon and Hong Kong Island, but with congested roads and little respect from bus, minibus and taxi drivers, their situation is often precarious. "The interest in cycling is definitely there, but the infrastructure we have is pretty inhumane," says architect Joseph Ng. Drivers often assume that cyclists do not belong on the roads and treat them with little respect. 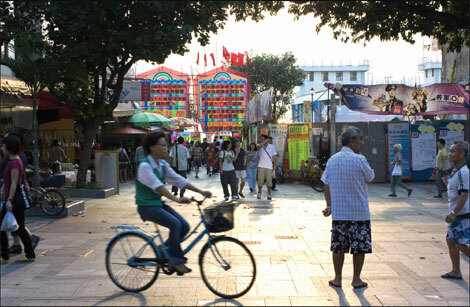 "Once, I was biking up Shanghai Street and there was this taxi behind me. (The driver) accelerated past me and cut me off - my front wheel was just a few inches from him. I swear he did it on purpose." The government's policy on the matter is unclear. "It is not the government's policy to encourage the use of bicycles as a transport mode in the urban areas," said Transport Commissioner Joseph Lai earlier in September, citing a lack of road space and well-developed public transport. Yet the government's own website extols the virtues of cycling as a mode of transport even as policy-makers warn against it. "Aside from the health benefits and fun of cycling in Hong Kong, cycling can help reduce pollution and thus clean the air," reads the website. "So why not take cycling as a means of transport for short-distance travel?" The inconsistency of the government's approach to cycling is compounded by the lack of data on cycling in Hong Kong, which has not been included in the government's transportation surveys. That might soon be about to change. Cycling's increased popularity appears to have spurred the government to take more action. "In recent years, more and more people seem to be interested in walking or using bicycles," said Transport Department planner Anthony Loo in August. Now, for the first time, this year's Travel Characteristics Survey will includes questions on cycling. For cycling advocates, the harborfront can be another catalyst for change. By introducing a space for bicycles right in the heart of Hong Kong, rather than in the hinterland of the New Territories, it can be a highly symbolic acceptance of bikes as a part of urban life. To ensure compatibility between cycling and different activities on the harborfront, the Cycling Alliance has proposed a so-called cycleway from Kennedy Town to Shau Kei Wan. 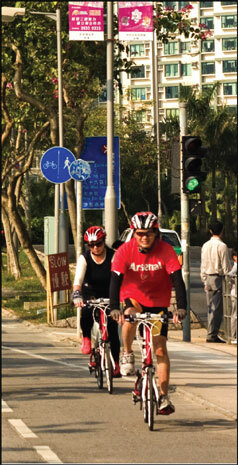 Unlike the New Territories' cycle tracks, which are completely segregated from roads and pedestrian footpaths, the cycleway would include space shared by cyclists and pedestrians. In some cases where the waterfront promenade is too narrow to accommodate bikes, it may also include on-street bicycle lanes. Turner says that commuters can use the corridor as a way to traverse Hong Kong Island, while the casual visitor may rent a bicycle from bike-sharing stations to get from one part of the harborfront to another. When it was presented to the Harbourfront Commission earlier in September, the cycleway proposal was met with interest, though several commission members were not entirely convinced. Peter Cookson-Smith was the most vocal critic. He raised concerns that the presence of bicycles may create conflicts between cyclists and pedestrians. "We are trying to open up the waterfront to a whole host of activities," he says. "I would hate to say as a matter of policy we shouldn't have bicycles along the waterfront, but it's a matter of getting our priorities right. If you stop and think about how people are going to use (a cycleway), you can't imagine a guy going from Shau Kei Wan up to Soho - even if he did, he would have to drop off his bike and walk the two kilometers uphill to where he's going." In other words, says Cookson-Smith, Hong Kong's hilly topography and excellent public transport would make cycling an unappealing choice for most people in the urban areas, even if they did have a cycling route along the harborfront. But Turner says that it's just the opposite: Hong Kong, by virtue of its density, is a perfect place to ride a bike. It takes more than 20 minutes to travel from North Point to Wan Chai by bus, depending on traffic and waiting times; by bicycle, it's no more than 10 minutes. "When you get on a bike, you are not taking up space on the crowded pavement, you are not filling a seat on the bus and you are not blocking the MTR doors," says Turner. "Because Hong Kong is so compact, there is all the more reason to make use of bikes." Sujata Govada, an urban planner who sits on the Harbourfront Commission when Cookson-Smith is unable to attend, is more receptive to the idea of bicycles on the waterfront. She is especially fond of the idea of shared space between pedestrians and cyclists, which has also been used on Singapore's East Coast promenade. The same approach may be used for city streets that are pedestrianized, she says. What is important, she says, is introducing changes incrementally - a strategy employed with great success in European and North American cities that have seen cycling transformed from an eccentric activity to a major form of transport. In Copenhagen, for instance, nearly 40 percent of the population cycles to work, a figure expected to grow to 50 percent by 2015. "We can do it by trial and error, which makes it easier to ease people's concerns," says Govada. "If we were sitting in Copenhagen, we wouldn't even be talking about this because it's taken for granted that cycling is a necessity. But it developed that way over time."